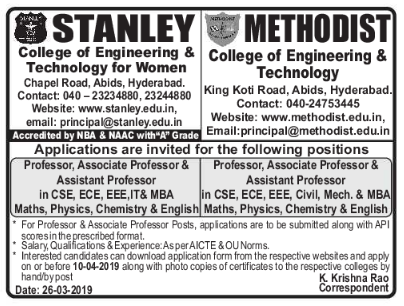 Methodist College of Engineering and Technology Jobs 2019: Methodist College of Engineering and Technology is released notification for Professor/Associate Professor/Assistant Professor Vacancies. Currently it has openings for Professor/Associate Professor/Assistant Professor Posts. Interested candidates can download the application form in College website and attach the with all copies of Educational certificates and recent PassPort size photograph to the college Address given below. 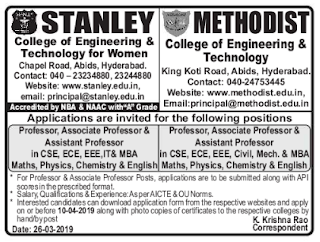 Refer the Official website http://www.methodist.edu.in/ for more details of Stanley College of Engineering and Technology for Women Professor/Associate Professor/Assistant Professor Posts. Available vacancy, Salary, Important dates, Selection Process, Application Procedure, Qualification are maintained below. Methodist College of Engineering and Technology. Starting Date to apply for Professor/Associate Professor/Assistant Professor: 29-03-2019. Ending Date to apply for Professor/Associate Professor/Assistant Professor: 10-04-2019. Eligible and Interested candidates can download the application form in College website and attach the with all copies of Educational certificates and recent PassPort size photograph to the college Address given below.